Hi Friends! Thanks for joining me today. I've got a batch of sweet creations to share with you, inspired by Summertime festivities - in particular - my favorite thing ever - carnivals! I love the sights, sounds, and the aroma of all the deelish, and terribly bad-for-you food - my favorite being cotton candy! It reminds me of my childhood and rides on the merry-go-round and yoyo. Oh to be a kiddo again! It's been a while since I've visited the fair, but these last few days the exhibition has been in town and we've driven by a few times, and it just got me thinking about whipping up some cards inspired by the pretty colors and sights. So without further ado, here are a few little treat baggies inspired by all the marvel that carnivals bring! 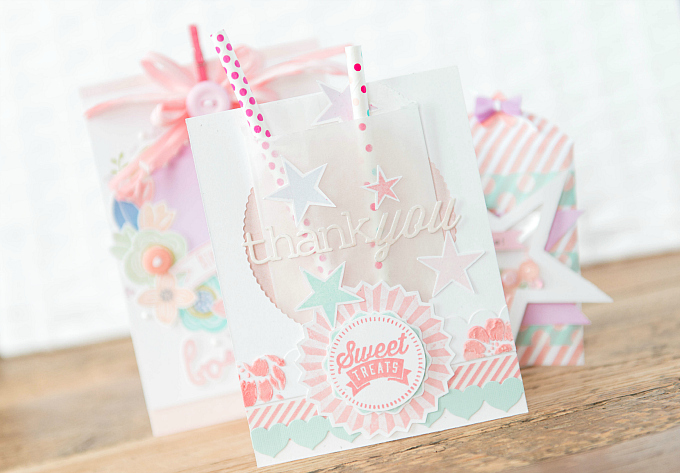 The first treat baggie is actually a card, with a glassine front, that can be filled with sweet confections of all sorts. I added the two straws because I thought they would make a cute way to display a little treat - one that can be skewered perhaps. 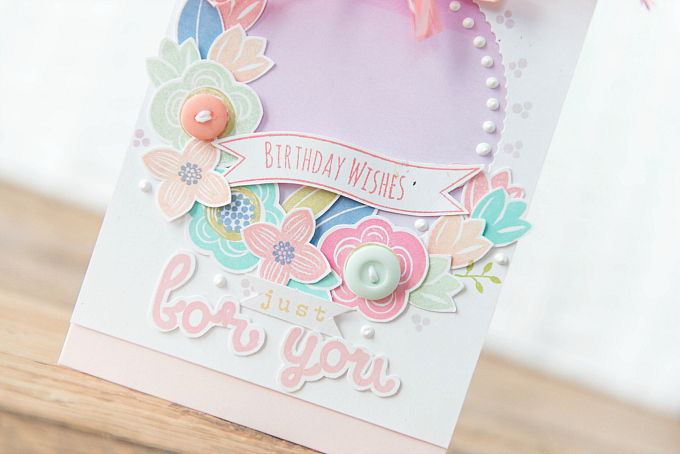 To create the card, I started with a cardstock base, and cut a scalloped circle using PTI's Scene It: Basic Backer Die. Inside, I tucked and glued a glassine bag, and a piece of pink cardstock to cover the hole. At the bottom, I layered some washi tape, diecut hearts from PTI's Heart Border die, and some scalloped borders with textured paste (for a full post on this technique, click here). 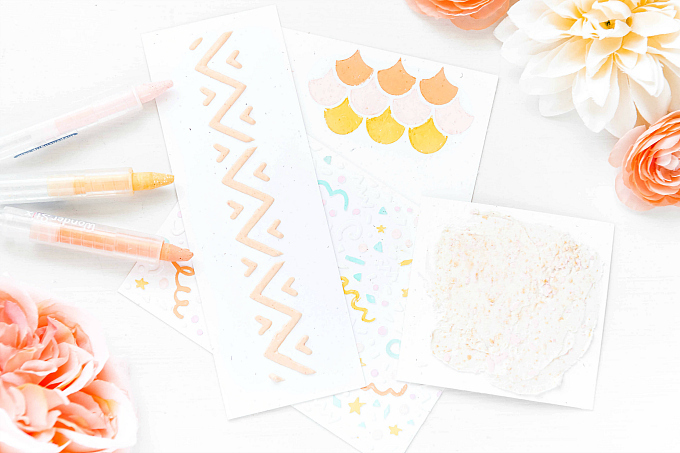 Along the glassine bag, I assembled several stamped and cut starts from Close To My Heart's sweetest new stamp set, Little Dreamer. I can't wait to use the unicorn in this set! He's loaded with attitude! 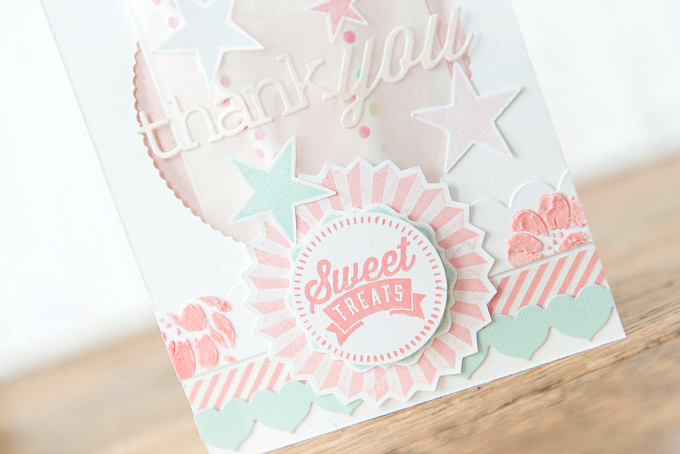 The thank you diecut is from Papertrey Ink, Wonderful Words: Thank You. At the bottom, I added a stamped rosette (reminds me of pretty ribbon awards at the fair) and a sentiment. 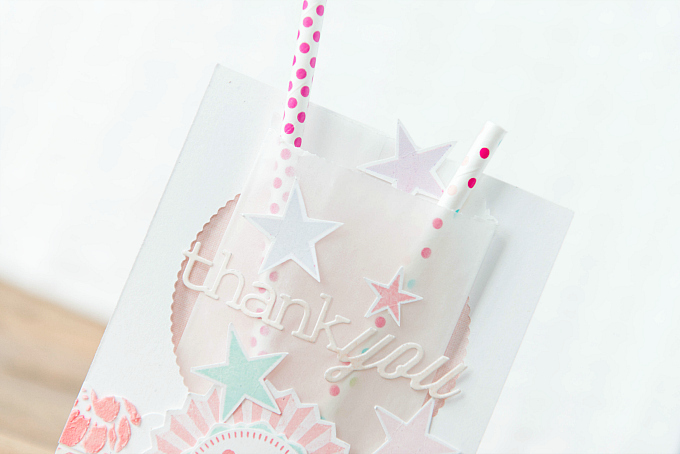 This next treat bag is a little pouch, created with PTI's Seed Packet Die and some striped patterned paper. 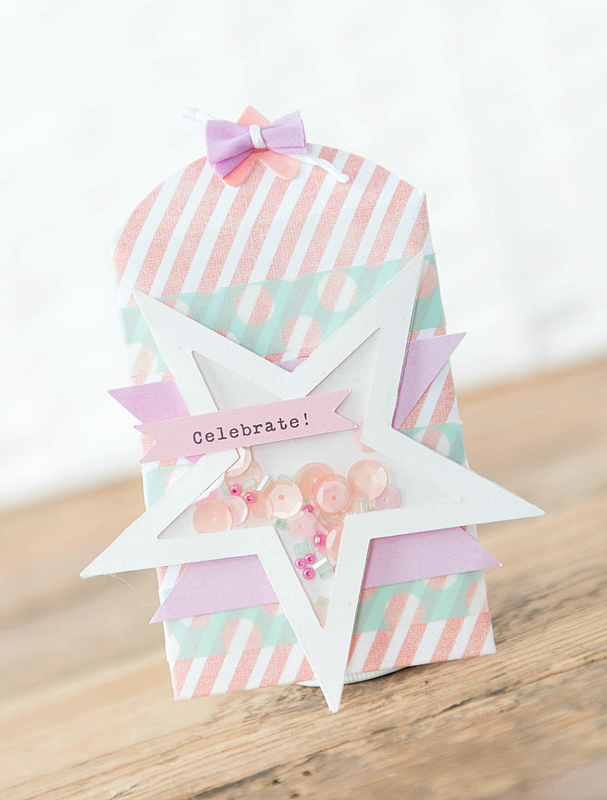 For the pops of color, I added a bit of aqua washi tape, some lilac paper and a shaker star. Sadly, I don't have any shaker dies, but I do have plenty of nesting dies that I thought would work perfectly for making a DIY shaker! 2. Using the largest and second largest star, I cut another star out of cardstock, but then nested the smaller star within and cut out the middle part, so that I would only be left with the star border. To position everything, I used bits of washi tape, which is my lifesaver!!! 5. I then used a chunky bead of hot glue to glue the two pieces together (piece from #1 and #4), leaving a small portion unglued so I could tuck in sequins. The reason I used a chunky bead, is because I wanted there to be dimension between the two layers to allow for plenty of filling. Note: when working with the hot glue, do not squish the stars together, rather gently press them in place, allowing for the glue to dry. Otherwise, you will end up with hot mess! Trust me! 6. Once glued together and dried, add the itty bits, and glue the last little opening with just enough glue to hold everything in place - this step is a bit tricky and it helps to have a toothpick handy to push all glue inside while it's still hot. Be warned, this technique can get messy, but I hope you'll give it a try! 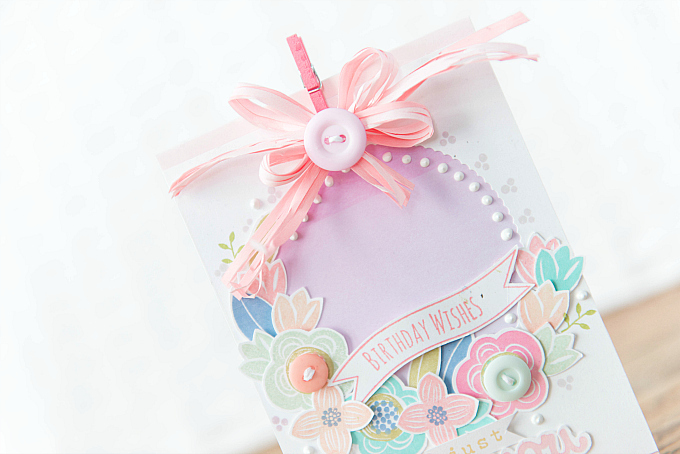 The last pouch is actually an envelope that I've decorated, but it's big enough to hold a lot more than just a note...I started with a blush envelope, and layered a piece of cardstock with a scallop cut-out, using PTI's Scene It Basic Backer die. I backed it with some lilac paper, and a lot of lovely layers of Shower Flowers. For the stamping, I used Hibiscus Burst, Melon Berry, Berry Sorbet, Hawaiian Shores, Vintage Jadeite, Simply Chartreuse, Blueberry Sky, and Bright Buttercup. 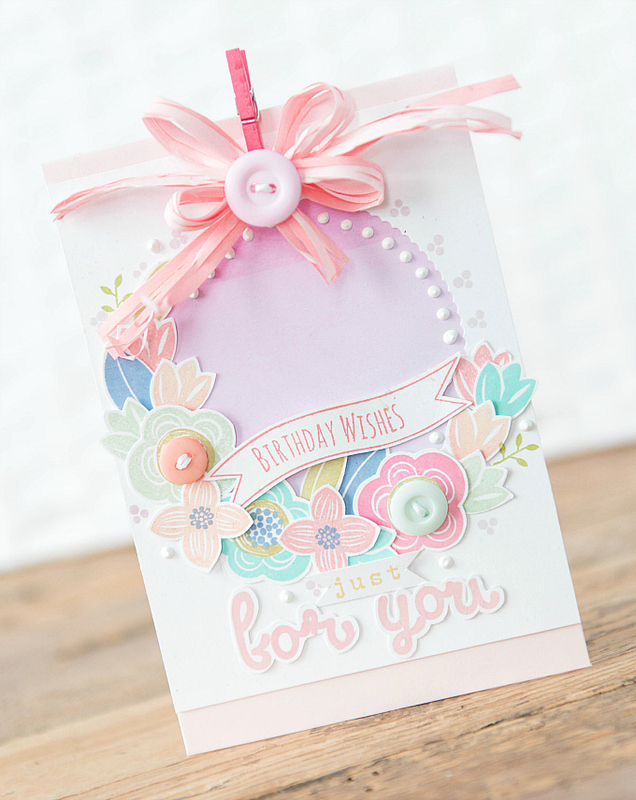 I wanted some movement in the card, so I added some liquid pearls and a few little stamped dots. So fun making these cotton candy creations. AND they're all ready to go, in the shoppe! Hope you'll join me again soon for more colorful cards! These are all just as pretty as they can be! I love your idea of tucking the glassine bag into the circle cut out, very clever! Thanks my dear Aneta!! Shoppe is slowly getting restocked :) Very big thank you for visiting and sweet words! Thank you so much, Karen! You are much too kind. It warms my heart so much that these little things put a smile on your face! Sending you many more sunshiny days! p.s. I love your little pun! These are gorgeous. Love the colors you use! My favorite carnival/fair food is the Elephant Ear. If you aren't familiar with them, it is a relatively thin and large flat dough (probably friend and) covered with icing. Next to that, are Funnel Cakes. It is a batter that is poured out of a funnel into hot oil. They fry. They are taken out and served on a plate with lots of confectioner's (powdered) sugar. These are light and crunchy, whereas the other are doughy and chewy. So yummy, both of them! My wife and I tease each other saying I will let you out of the car next to the carnival. Run in and get us some Elephant Ears and Funnel Cakes. I'll drive around and around until I see you, then I will pick you up and go enjoy our fair food!!! We are silly!